Verdict: Contribute CS5 is part of the Web Premium and Master Collection editions, so if you own one of those, you basically get Contribute for free. But as a standalone product, it is priced unattractively, and the upgrade pricing is no picnic, either, especially if you upgraded to Contribute CS4, itself an anemic upgrade. It makes little sense to spend around $200 on a product that can only edit, not create, Web pages. The new features are useful, but for most people, won’t elicit that “gotta have it” response. Instead of adding content in a full Web site creation tool such as Adobe Dreamweaver, the Contribute user works in a near-WYSIWYG environment similar to a word processor. 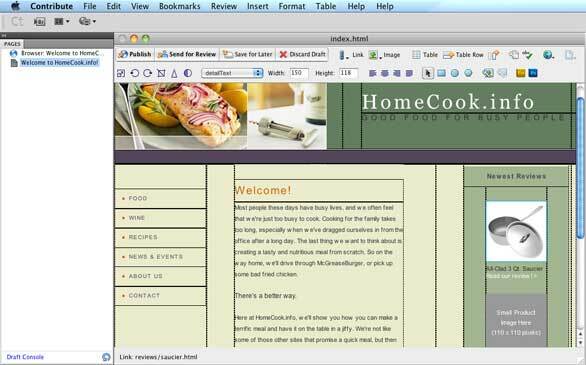 Using page templates prepared by a designer using Dreamweaver, site contributors may only modify content within specified editable regions, preventing them from accidentally breaking the site’s design or structure. The CS5 version offers a small handful of new features, but is otherwise a pedestrian upgrade. The most welcome enhancement is subtle but important. Contribute’s built-in browser is now based on Web kit, the same rendering engine that powers Safari, Google Chrome, and iOS and Android mobile devices. This greatly improves the fidelity of viewing pages. Besides the built-in view, you can, as usual, preview with other browsers on your computer. But now you can open your page for preview in multiple browsers with a single action. Mac Contribute users are shortchanged here. On Windows, Contribute provides a three-pane view that simultaneously shows Webkit, Internet Explorer and Firefox page renderings in the document window. Unfortunately, Contribute is not integrated with Adobe’s BrowserLab online web page previewing service, as is Dreamweaver CS5. Previously, the content of server-side includes (SSI) – files that reside on the server and are interpreted by it to place their content on multiple site pages (think page headers or footers) – were off limits. Contribute CS5 identifies SSI content and lets you edit them like any other page element. When working with images on your draft pages, Contribute now has improved integration with Fireworks or Photoshop; buttons for these programs appear in Contribute’s editing toolbar when you select the image. Changes made in an image editor now appear immediately in the page draft, rather than first requiring you to publish the page to the server. Also new to image handling in Contribute is the ability to create image maps; the program now has rectangular, oval, and polygon tools to designate clickable areas of the image, and allows users to add the related links. For example, a Contribute user could add clickable areas on an image of a campus map, linking to descriptive pages for each building. For larger organizations, the program now supports the Subversion (SVN) version control system. Once enabled by the site administrator, site contributors have easy access to many Subversion operations. Contribute works with the SVN repository to create and manage pages; view, edit and compare the revision history of the current page; and insert page comments for other contributors. It’s no substitute for a dedicated Subversion client program, but it isn’t meant to be; rather, it shields the non-technical user from the complexities and delivers the most-needed features.